These mouthwatering bite-sized low carb paleo snacks are the perfect snacks to eat when you are trying to lose weight, but still want to feel full and satisfied. 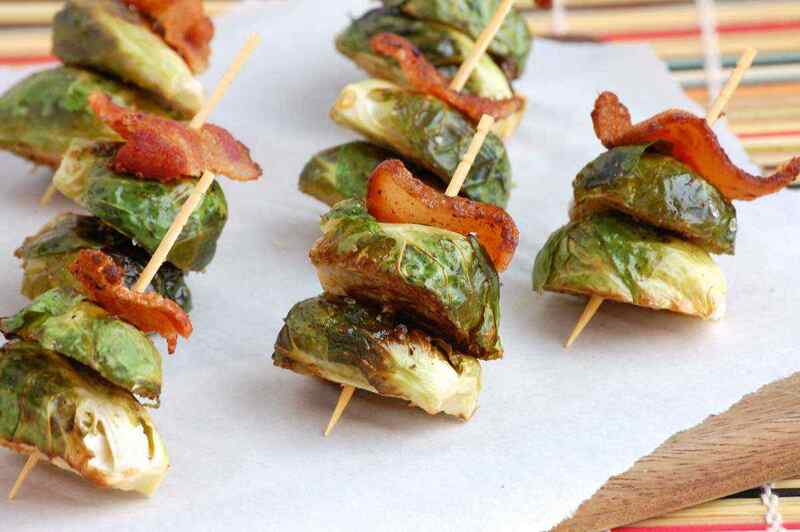 Salty bacon is delicious paired with roasted Brussels sprouts. The brussels sprouts obtains a nutty sweetness in the oven as it cooks. Before roasting, make sure to thoroughly wash and dry the Brussels sprouts, trimming off the ends and removing the very outer leaves. Serve on toothpicks for easy snacking. 1. Preheat the oven to 400 degrees F. Trim the Brussels sprouts, cut them in half and place on a rimmed baking sheet. Drizzle with olive oil and liberally sprinkle with salt and pepper. Bake for 20-25 minutes, tossing occasionally, until lightly browned and cooked through. 2. Meanwhile, add the bacon to a skillet and cook until crisp. Transfer to a paper towel-lined plate. Once cooled, break each piece into chunks. 3. Add a chunk of bacon and then the Brussels sprouts onto toothpicks. Arrange on a plate and serve immediately. Instead of an entire pizza, enjoy this bite size paleo snack that is easy to eat. 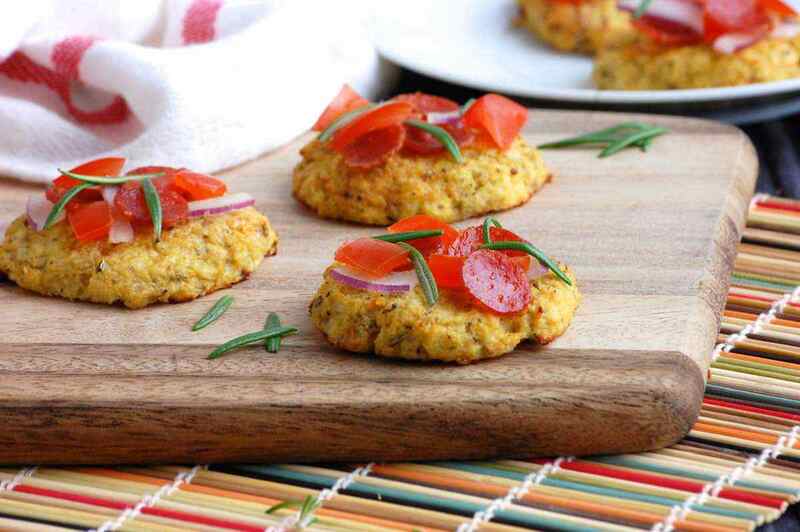 The low carb, gluten-free cauliflower pizza bites are definitely customizable. Add your favorite pizza toppings after the round bites are done baking, which is fun for a family or a crowd. Try to wring out as much moisture as possible from the cauliflower before baking. 1. Place the cauliflower florets into a blender and process until they reach a rice-like consistency. Transfer to a pan and add a splash of water. Season with salt and pepper. Cook for 6-8 minutes until soft, adding more water if necessary. 2. Place the cauliflower onto a towel and wring out excess moisture. 3. Preheat the oven to 400 degrees F. Line a baking sheet with parchment paper. In a medium bowl, mix together the garlic, egg, Italian seasoning, and salt and pepper to taste. Add the cauliflower to the bowl and stir. 4. Shape the dough into bite-size patties with your hands and place on the baking sheet. Bake for 20-25 minutes, adding pepperoni halfway through if using. Top with cherry tomatoes, onion, and rosemary to serve. Serve immediately. These tater tots are one of the more difficult paleo snacks to prepare but are well worth the effort. Addictive and flavorful, these treats can also be frozen before cooking to be ready at a moment’s notice. After numerous trials, frying the tater tots in a pan seems to work better than baking them in the oven. Add more coconut oil to the pan in between batches for crispier tater tots. 1. Place a couple inches of water in a large pot. Once water is boiling, place a steamer insert and then cauliflower florets into the pot and cover. Steam for 10-12 minutes, or until barely tender. Drain. 2. Add the cauliflower and onion to a food processor and pulse to break down into smaller pieces. Transfer to a large bowl. Stir in the egg, parsley, coconut flour, garlic powder, salt, chili powder, and pepper. Stir well to combine. 3. Use your hands to shape the mixture into small cylinders. Place aside until ready to fry. 4. Add enough coconut oil to cover the bottom of a large skillet over medium heat. Working in batches, add the tater tots to the skillet and fry until golden brown, turning carefully to brown each side. Once crispy, place onto a paper towel-lined plate. Repeat with the remaining cauliflower mixture, adding more coconut oil to the pan each time. Serve warm. Shishito peppers are just the right size for snacking. Shishito peppers are a sweet, crunchy Asian variety of peppers (and not too spicy). Pack them full of guacamole for an easy finger food. 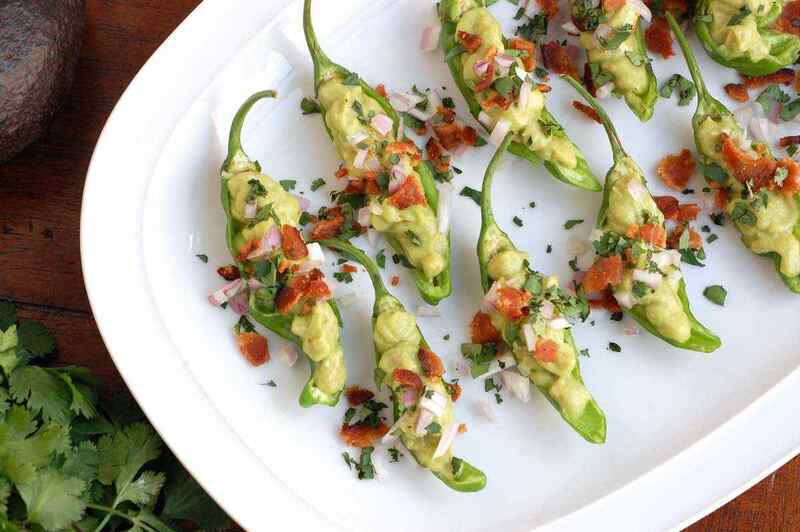 Sprinkle with bacon and cilantro or your favorite toppings. 1. Cut the peppers in half and remove the seeds. Set aside. 2. Cook the bacon in a large skillet on the stove until crispy. Remove to a paper towel-lined plate and crumble into pieces. 3. Cut the avocados in half and remove the pits. Scoop out the avocado into a large bowl. Add the lime juice and mash with a whisk. Add in the salt, cumin, paprika, and garlic and stir. Mix well and taste to adjust seasonings as necessary. 4. Carefully spoon the guacamole into the peppers. Top with red onion, cilantro, and crumbled bacon to serve. In this recipe, simple ingredients are transformed into a snack worthy of serving to guests or friends. Ripe avocado is first mashed into a tasty guacamole with shallot and lime juice. 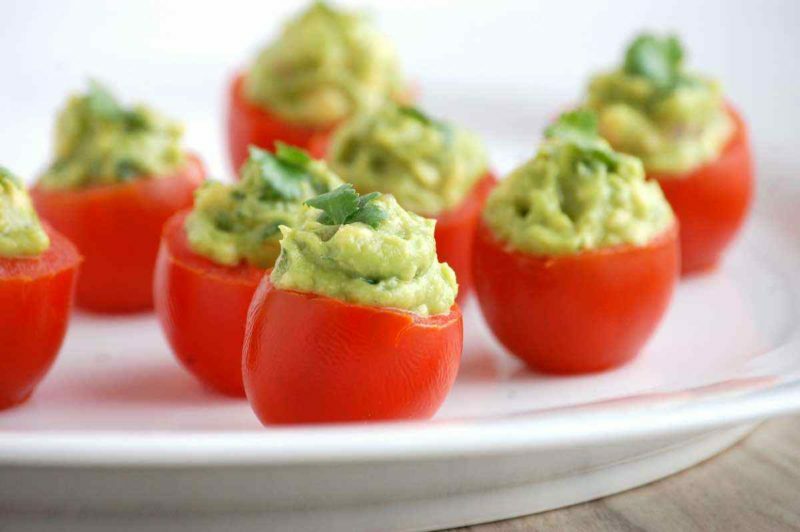 Then the guacamole is piped into cherry tomatoes for a fun, easy finger food. If any of the tomatoes do not sit flat, simply cut a small slice off of the bottom. 1. To prepare the tomatoes, cut off the tops and hollow out the middle, scooping out any seeds. Set aside on a plate. 2. Cut the avocado in half and remove the pit. Scoop out the avocado into a large bowl. Add the lime juice and mash with a whisk. Add in the shallot, cilantro, cumin, chili powder, and salt. Mix well and taste to adjust seasonings if necessary. 3. Fill each tomato with the guacamole. Serve topped with more cilantro if desired. The combination of cucumbers, sun-dried tomatoes, and fresh basil gives this paleo snack a fresh Mediterranean flavor. Almond “cheese” is also added for its rich and creamy texture. Use high quality extra virgin olive oil for the best flavor, since the bites are served raw. 1. Arrange the cucumber slices on a plate and lightly season with salt and pepper. 2. 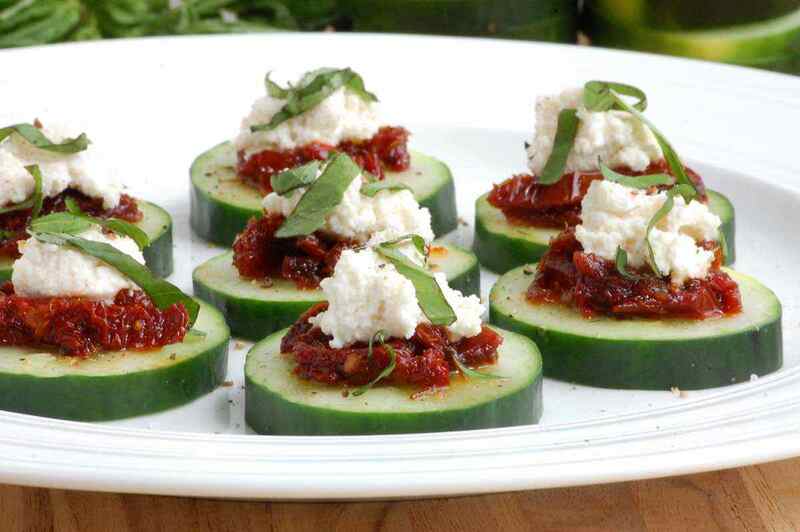 Top the cucumbers with sundried tomatoes, and then add a dollop of almond cheese on each. Sprinkle with basil. Drizzle with extra-virgin olive oil and serve immediately. 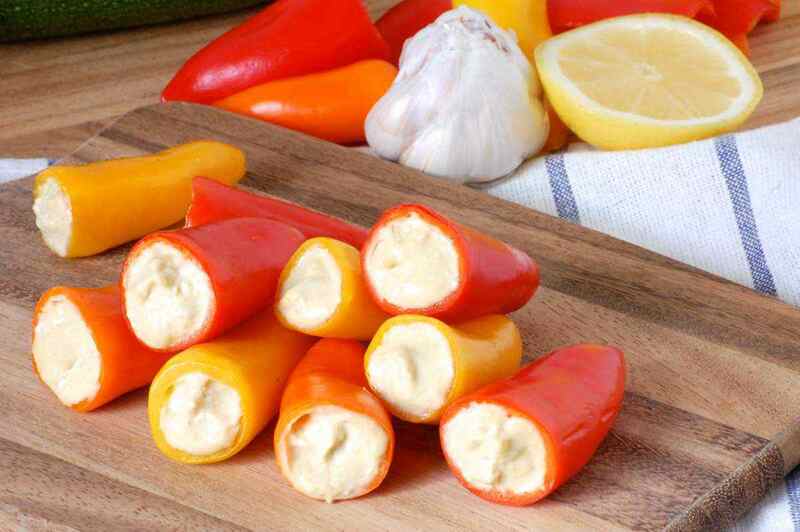 Mini bell peppers are perfect for Paleo snacking because they are just the right size for curbing hunger in between meals. They can be enjoyed with many different dips and spreads, or eaten on their own. This recipe makes a quick zucchini-based hummus in the blender to serve with the mini bell peppers. You can either pipe the hummus into the peppers, perhaps for an appetizer, or use the hummus as a dip. 1. Trim off the stems off the bell peppers and remove the seeds. Set aside. except the bell peppers into a food processor and blend until smooth, scraping down the sides as necessary. Adjust levels of lemon juice and tahini to taste. Refrigerate for 30 minutes. 3. Transfer the hummus to a bag and pipe into the bell peppers. Serve cold. For the times when you are not able to grill, make zucchini under the broiler for a healthy snack that is incredibly easy and straightforward. The zucchini should cook until slightly tender and charred, but not mushy. 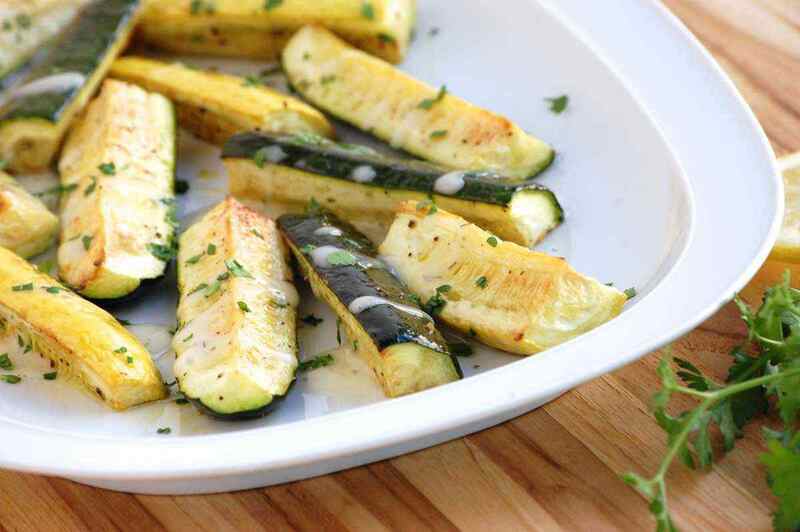 To serve the zucchini, you also have the option of drizzling them with a simple lemon dill aioli. 1. In a small bowl, whisk together the mayonnaise, dill, apple cider vinegar, lemon juice, mustard, and garlic powder. Thin with cold water until it reaches desired consistency. Season to taste with salt and pepper. Set aside. 2. Preheat the oven to broil. Move the top rack to the highest position, approximately six inches below the broiler. Cut the zucchini and squash into halves and then into quarters. Arrange on a baking sheet in an even layer with the cut side up. 3. Drizzle the zucchini and squash with olive oil and toss well to completely coat. Sprinkle with salt and pepper. Broil for 8-10 minutes, flipping once halfway through, until fork-tender and golden brown. Arrange the slices on a plate. Drizzle with aioli and sprinkle with cilantro to serve. 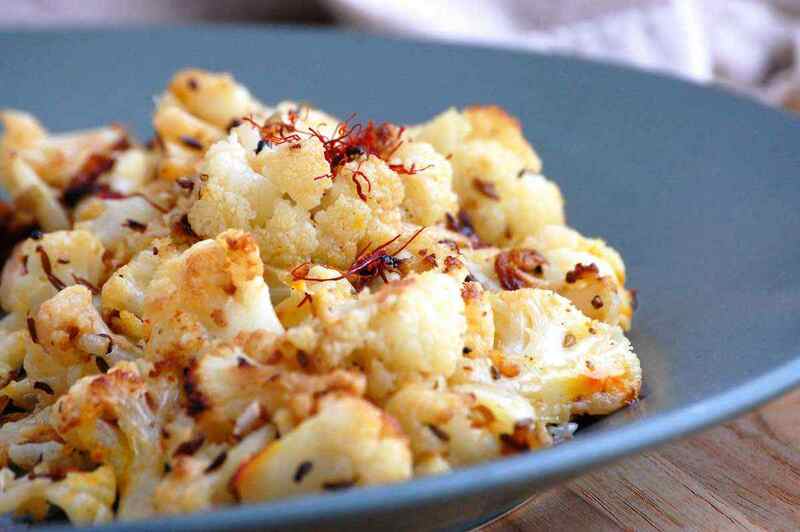 This low carb recipe presents a slightly fancier way to enjoy cauliflower as a snack. The cauliflower is briefly steamed first, until barely tender. It finishes cooking in a skillet along with the fragrant ingredients of saffron, garlic, ginger, and cumin seeds. The end result is a delicious balance of flavors. 1. Place a couple inches of water in a large pot. Bring the water to a boil and place a steamer insert and then the cauliflower florets into the pot and cover. Steam for 8-10 minutes, until barely fork-tender. Drain. 2. Heat the oil in a large skillet over medium heat. Add the saffron, garlic, ginger, cumin seeds, and shallot. Sauté for 3-4 minutes until the shallot is translucent, stirring regularly. 3. Add the cauliflower and cook for 8-10 minutes over medium-high heat, stirring only occasionally. Add salt and pepper to taste. Serve immediately with a drizzle of lemon if desired. Skip the expensive olive bar and marinate olives your own way. It is easy to add layers of flavor to the marinade when you include orange zest, thyme, and red pepper flakes. Good quality olive oil will produce the best results for this recipe. The flavors improve with the longer that the olives marinate. 1. Place the olive oil, garlic, and red pepper flakes in a small saucepan. Warm over low heat until the garlic is fragrant, 2-3 minutes. Remove from heat and stir in the thyme, orange zest, and fennel seeds. 2. 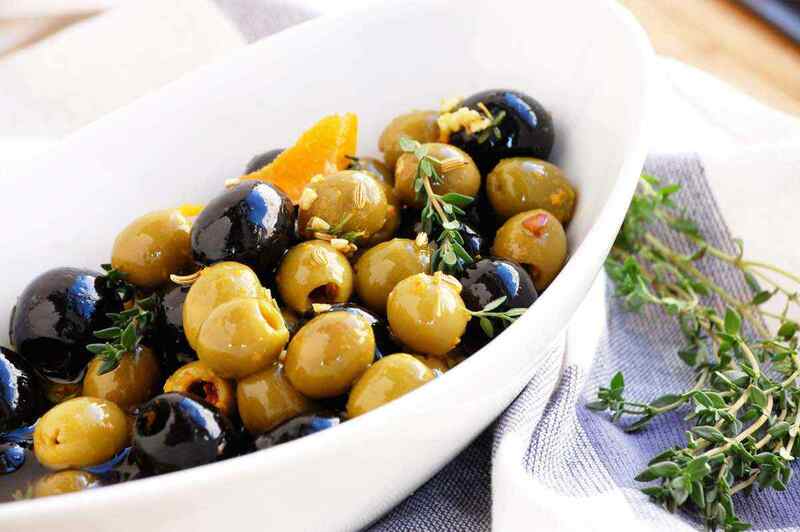 Place the olives in a glass container and drizzle with the olive oil mixture. Gently stir to coat. Refrigerate for at least one hour before serving. Crispy, caramelized broccoli makes great finger food. 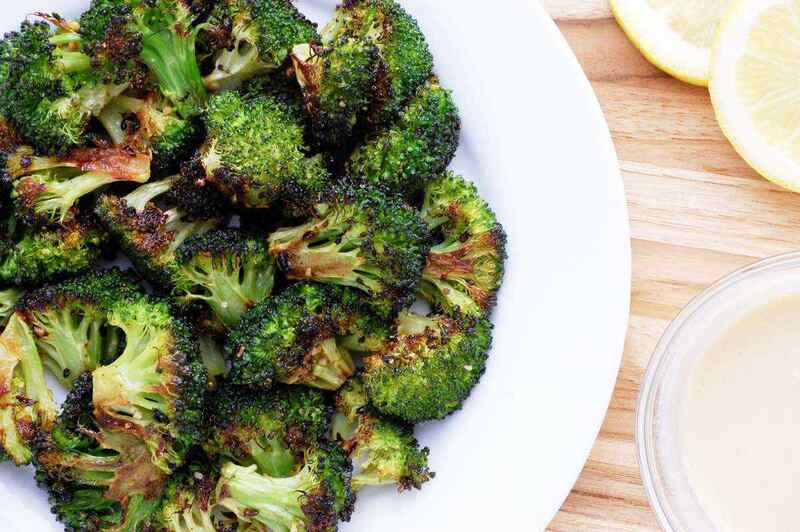 This paleo snack recipe also includes a tahini-based dipping sauce, which adds a bright accompaniment to the roasted broccoli. The dipping sauce can be prepared while you wait for the broccoli to cook. Make sure to thoroughly dry the broccoli so that it will get crispy in the oven. 1. Preheat the oven to 400 degrees F. In a small bowl, whisk together the tahini, lemon juice, garlic powder, and salt. Slowly add in the water until the dip reaches the desired consistency. Adjust lemon juice to taste. Set aside. 2. In a large bowl, toss the broccoli with olive oil, garlic, salt, and pepper. Spread the broccoli in a single layer on a rimmed baking sheet. Bake until the florets are fork-tender and the edges are browned, 12-15 minutes, turning once. Serve warm with the dipping sauce on the side. Summer produce is delicious when served in an uncomplicated way that lets the natural flavors shine through. Cherry tomatoes are often bursting with juices and flavor. For this recipe, simply roast them in the oven with olive oil and garlic before serving. 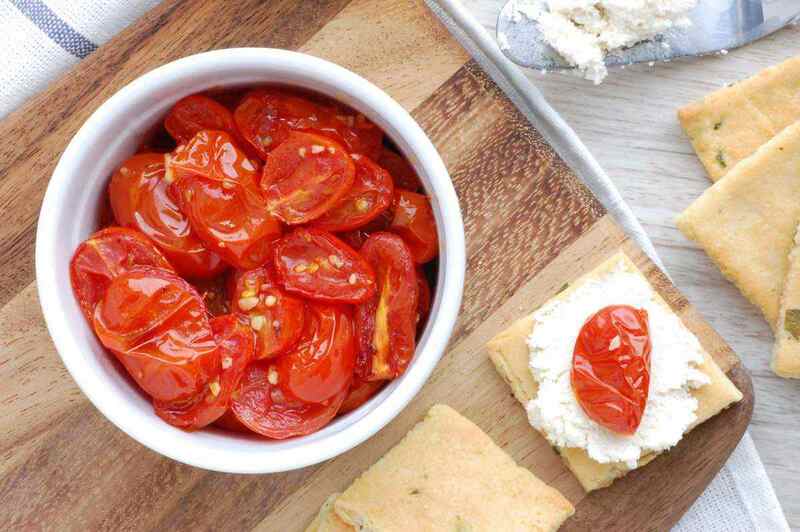 Enjoy the tomatoes on their own, or perhaps served on crackers with macadamia nut cheese. 1. Preheat the oven to 400 degrees F. Place the tomatoes on a baking sheet and drizzle with olive oil. Sprinkle with garlic, salt, and pepper and toss to evenly coat. Bake for 15-20 minutes until soft. Serve immediately. 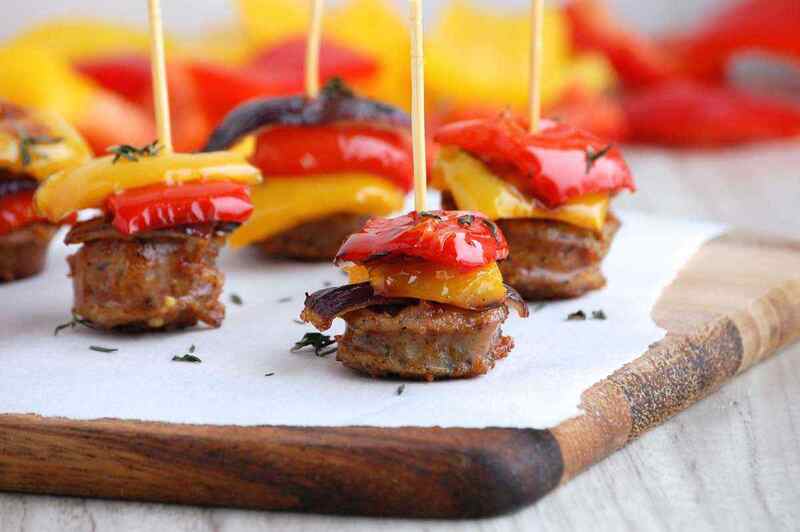 These skewers are a great hearty snack for weekend afternoons. Roast the ingredients together in the oven, and then skewer with toothpicks for easy serving. Share with the whole family! A pesto or tomato dipping sauce on the side is also recommended. 1. Preheat the oven to 400 degrees F. Place the bell peppers and red onion in a large roasting pan. Drizzle with olive oil and sprinkle with salt and pepper. Toss well to coat. Roast for 20 minutes, turning once. 2. Add the sausages to the pan and sprinkle everything with the garlic and thyme. Roast everything together for an additional 20 minutes or until the sausages are cooked through, stirring occasionally. Skewer with toothpicks to serve. 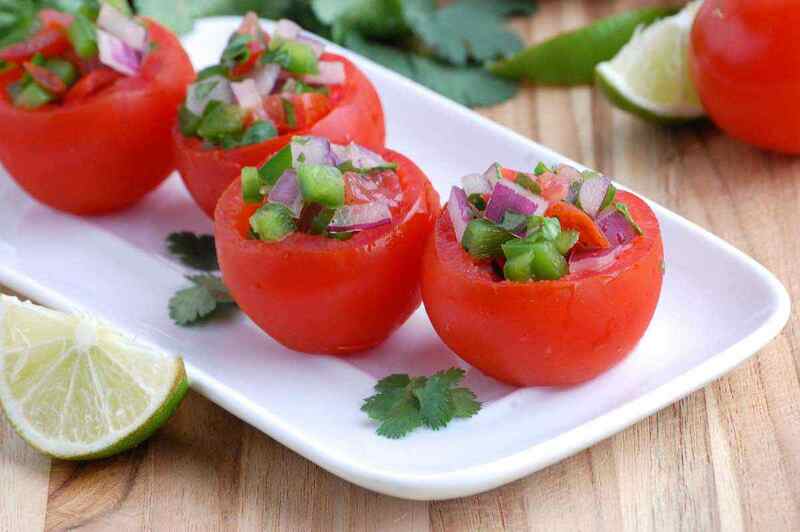 A great way to serve fresh, zesty salsa is right in the natural bowl of a tomato. 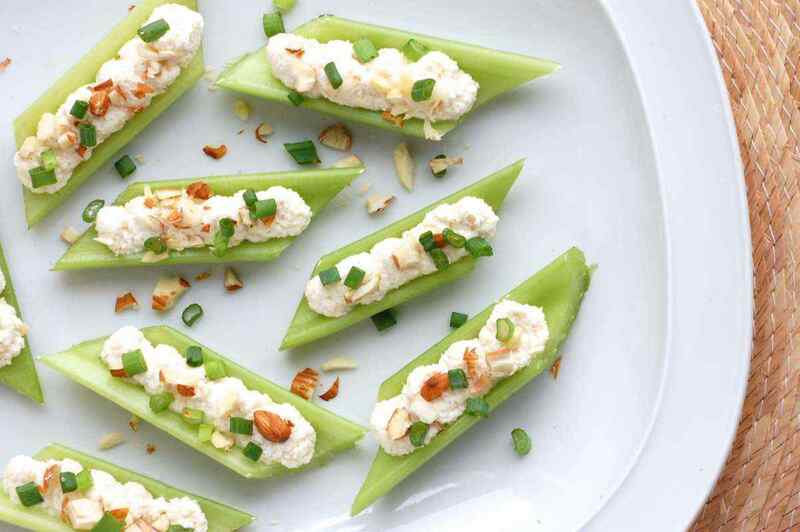 This fun low carb snack is easy to prepare; there is no cooking required. The bright, flavorful salsa filling can be made ahead of time and stored in the refrigerator to let the flavors meld together before serving. 1. Slice the tops off the tomatoes and scoop out the insides. Finely dice the tops of the tomatoes and place into a small bowl. Add the remaining ingredients and stir well to combine. Spoon the salsa mixture into the tomato cups. Serve chilled. 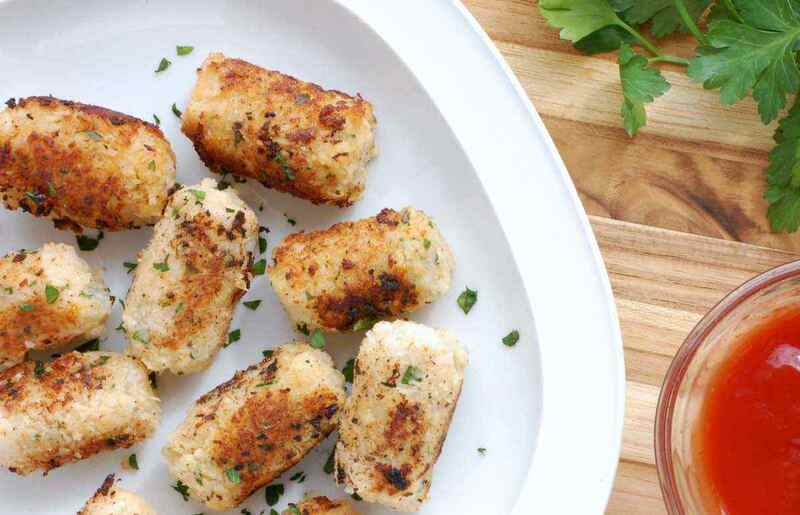 This recipe finds yet another use for macadamia nut or almond “cheese.” Mix the cheese with a bit of mustard and onion powder and then serve on celery sticks for an effortless and savory snack. Top with green onions, sliced almonds, or perhaps olives, whatever is your preference. The cheese mix could also be used as a dip with the celery sticks. 1. In a small bowl, stir together the macadamia nut cheese, mustard, onion powder, salt, and pepper to taste. 2. Arrange the celery on a plate. Spread the filling into the celery pieces. Top with chopped green onions and almonds to serve. This easy snack makes a fun twist on sushi rolls. Tuna is used as the filling along with carrots and avocado. 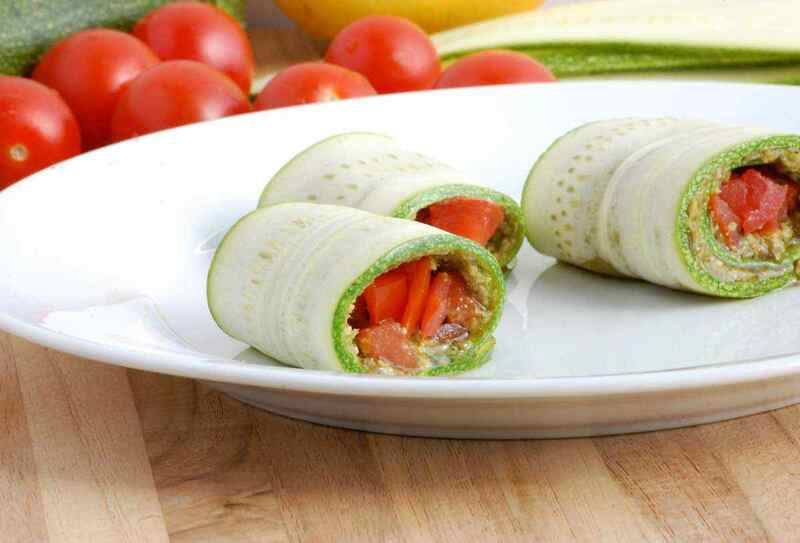 Everything is wrapped up together in a thinly sliced cucumber roll. Use a vegetable peeler to create the long and thin cucumber ribbons. The rolls come together in no time, although the tuna should be refrigerated before serving so that it’s cold. 1. Use a vegetable peeler or mandolin to thinly slice the cucumber into long ribbons. Set aside. 2. Combine the tuna, mayonnaise, lemon juice, onion powder, and scallions in a medium bowl. Add salt and pepper to taste. 3. Spread one to two tablespoons of tuna onto the end of a cucumber slice. Top with a few pieces of avocado and carrot. Roll up the cucumber slice and secure with a toothpick. Repeat with remaining ingredients. Serve cold. Zucchini is definitely one of the most versatile vegetables. In this recipe it is made into a roll-up with cherry tomatoes and pesto. Instructions for a quick basil pesto are included in the recipe, but you could use any of your favorite pesto sauces. If the roll-ups won’t stay in place, secure them with a toothpick. They come together fairly quickly for a nice bite-size snack. 1. Slice the zucchini in half lengthwise, then use a mandolin to cut into long strips. Set aside on a paper towel to absorb any extra liquid. 2. Blend together the basil, garlic, pine nuts, lemon juice, olive oil, and salt in a food processor until evenly combined. Add additional salt and pepper to taste. 3. Spread about two teaspoons of the pesto over a strip of zucchini. Place a tablespoon of chopped tomato on the end of the strip and carefully roll up the strip. Secure with a toothpick. Repeat with remaining ingredients. Chill until ready to serve.